I’m playing the role of Alan Turing in the upcoming StageQ Queer Shorts 8 production, Of Machines and Men, which starts June 7, 2013. In case you aren’t familiar with Turing, he was a Brit who helped end World War II by cracking Germany’s Enigma code. He is considered the father of computing and artificial intelligence. He was also a gay man who was convicted of the crime of homosexuality, and given a choice between prison and taking estrogen therapy for one year. He chose the latter, so he could continue his important work. He ended up dying by cyanide poisoning; it was ruled suicide, but I don’t believe it’s so cut and dried. It could have been accidental, given the experiments he ran in his home. While the play, by definition of being a “short”, is no longer than 10 minutes, the playwright has done an amazing job of weaving together the important aspects of Turing’s life and thinking. As I learn my lines, I see more and more of the intricacy of the script, and am pleasantly blown away. 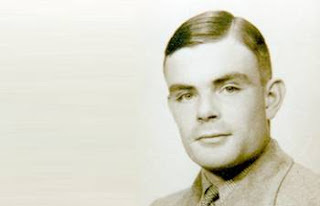 I’ve been reflecting on experiences in my own life that help me understand a bit about Turing. The seconds were kept by a continuously turning wheel showing five-second increments. The hour, 10-minutes and minutes were tracked by a wheel that flipped a card at each change. At four years of age I sat down with paper and pencil and watched this clock. I wrote down the time as it changed (I think I probably would have done this in 10- or 15-second increments). After doing this for several minutes, I stopped and looked at what I had written down—my database, if you will. I wasn’t sure what I was attempting to accomplish, and indeed, could not find a value for it in the moment. I did it because I had the intuitive sense there is something valuable here. I couldn’t figure out the value at the time, so I stopped. When I was in 7th or 8th grade, we got a Texas Instruments TI-99/4A Computer—I think it was a gift from my Uncle Charles, when he got his first IBM. And it came with the 128k extended memory cartridge, that slipped into the slot on the right side! I began to learn formal programming with this little machine, including making a video game of first one tractor then two attempting to run down hapless animals (forgive me, I was young). Although, the animal got the last laugh if the two tractors collided, standing on its hind legs and taunting the farmers. In 1981 I started high school. Also new to the school was its first Apple ][e, complete with two—count ’em TWO!—5.25″ floppy drives. I learned Apple Basic, devouring it eagerly. One of our math teachers took a summer class so he could teach the computer course. Because I was a freshman, I couldn’t take the class, so I taught myself. The school soon got more of these computers, and I stayed every night after school (when I didn’t do cross country or track) and wrote programs. In his day, Alan Turing had to face the disbelief and scorn that people had for his concept of “thinking machines.” I remember the first time I faced something similar. I was just learning Apple Basic, and create some sort of simple Hello World program to get the machine to do something. Getting machines to do things really got my imagination going. I was showing a couple fellow students this simple program, and a teacher came in the room, so I showed him. The first thing he pointed out was a misspelling in the output text. I could tell from his tone that he wrote off the computer, and my efforts, because of this error. To this day I must always be ready for how others cannot see past the literal images they see to the power and potential of the program behind. Also not to take this kind of thing personally. I loved those years during high school as I was learning to program. Eventually the students in the computer classes would ask me for help while we were in the lab after school. Not only did I help them figure out whatever problem or assignment they were working on, I went on to show them what else they could do. I learned that the computer teacher told his students not to ask me for help—apparently I was teaching them too much! My senior year I think I decided to not go out for one of the sports so that I could spend more time programming. At that time the girls gymnastics coach came to me with my first Request for Proposal (albeit verbal)! Keeping track of scores at girls gymnastics invitations was apparently a painful endeavor, with scores from all of these girls having to be tracked and tabulated on a board. She asked if I could write a program to do it. FINALLY! I could take this passion and DO something with it! I met with her and learned what today I would call the “business rules.” What’s the maximum number of teams at a meet? 8. How many girls on a team? How do you calculate the scores? How do you round the scores? Etc. I developed a very efficient program that showed, I believe, the 8 teams across the top and events going down the side. To enter scores, the user would hit a letter corresponding to the column and row (much like a spreadsheet), and the computer would ask for the score, then do the calculation. I tested the program and showed it to the coach. She loved it. The day came to use this child of mine at an actual home invitational. I rolled the cart down to the gym, and someone helped me carry it up to the stage, where the judges or whatever sat. I got the roster for teams and began entering them into the program. Can I just change it? NO! I can’t just change it! I don’t think I yelled at her (I was way too polite for that), but I told her that I couldn’t after furiously trying for a short while. I’d insert a metaphor here of an artist making a huge change to her piece of work or an architect changing the design after the project is half done, and you get the point. Today one of the first things I have to teach clients is the absolute meaning of these three words. Programming is very different from engineering or other disciplines in that most disciplines allow for approximations and estimations: in music you can be in tune enough, in engineering you can use approximate values1, but with a computer you must respect ALWAYS, EVER and NEVER. When I was told there would be eight teams, I should have asked, “So it is NEVER, EVER possible to have more than eight teams at an invitational? EVER?” In answer to questions like this, people often respond with, “well, not usually, so I wouldn’t worry about it.” My job is to worry about things just like that. Despite this first “failure,” to this day I continue to have a passion for helping people automate time-consuming or monotonous tasks, as well as helping individuals to connect through systems and data. I am certainly not Alan Turing—I’m not the genius he was. However, my life history has given me some preparation for understanding what he faced, both in terms of working with computers and living in the world as a gay man. I’m continuing to do research into who Turing was, so that I can portray this hero of mine as best I can. I want to do him justice. Please Come See the Play! check it out! Reserve your tickets here. This entry was posted in Uncategorized and tagged Computers, LGBT, StageQ, technology, Turing on May 9, 2013 by Jay. I think your comments about computing and engineering are correct. In computing, getting something even a little wrong usually results in an unacceptable product. However, with the advances in programming languages and interfaces, computing is gradually becoming more forgiving. It’s funny. The first thing I thought about when you said there were eight teams was, “Are there ever more than eight teams?” Great minds think alike!